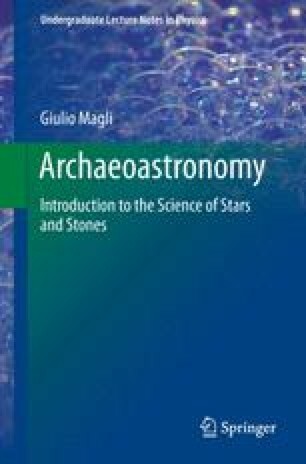 Since all the objects in the sky obey to the deterministic laws of physics, their past and future movements are in principle predictable with the use of mathematical equations, especially for the exceedingly short (as compared to the life of the universe or even of the solar system) periods that are the focus of archaeoastronomy, let us say—to embrace comfortably the most ancient temples of humanity at Gobekli Tepe—the last 12,000 years. Traceability is also important for those few movements (the so-called “proper motions”) that relate to single bright stars over the course of millennia (e.g. Sirius and Arcturus), which, if necessary, can be calculated with a reasonable degree of confidence. Up to the advent of personal computers, mathematical astronomy was a tedious chore, due to the difficulties of performing long equations by hand. Fortunately, today astronomical software does the job.